15 Minutes, Gosselin Style: What happened to the official Gosselin web site? Did they take it down to redecorate? To post Kate's book tour schedule? Revamping to promote the new show? Or maybe they didn't pay their web hosting bills. Jon and Kate's web site infamously has begged for a variety of freebies over the years, then tried to resell the same freebies on the same site, and at one point, Jon brazenly posted a link to girlfriend Hailey's twitter account. you can use robots.txt to deny all caching of your site. which is what they did. I think it is a good barometer of the lengths Tlc will go to see if they can get some to forget the lousy, cunning, greedy actions of a certain reality family. Tlc has the money and the power to make this happen. I will not forget though. Things like this have happened in the past, also. Speaking schedules were removed from websites when people started to notice how often Jon and Kate were gone on the weekends asking for "love-offerings" from churches. A blogger at the Reading Eagle all of a sudden stopped blogging about the Gosselins (this was even before they had a show), etc. A wikipedia article was edited to remove controversial information about the Gosselins (before the divorce). What I find strange now is that since Jon and TLC settled the suit, pics of Jon being a "good dad" are now popping up on ROL (even though they are giving it a negative spin). It as if they're attempting to rehabilitate his image now--like he's seen the error of his ways and is working on being a good father now. He, I'm sure, all along has been seeing the children and taking care of them on his custody days before this--so why all of a sudden this new spate of pics? TLC is gearing up for a new show, no doubt, and they want Jon's cooperation in filming the kids. The spin never stops with TLC and the Gosselins. The cached pages were taken down a while back but I know that some bloggers saved them before they were taken down. It's pretty entertaining to read them actually. It shows what greedy little grifters the Gosselins are. Discussion board on Amazon.com under Kate's book is CRAZY! 1. Kate's promise to love, honor & obey her husband, a vow she made at their wedding, before the kids were born. Kate broke that contract, watch seasons 1 - 5. The proof is in each episode. 2. Kate's promise to her children in the family mission statement episode. She made a big deal about the family's mission statement with Mady & Cara. She wanted to instill values in the kids, guess those values didn't apply to her. Kate lied and broke that contract, too many times to count. 3. Kate's promise to "be married to Daddy forever." Remember the renewal vows in Hawai'i? Isn't it interesting how the twins behaved, maybe they knew the truth about their parents but couldn't say anything. Humm, if you look at their Hawaii wedding picture, both twins look pretty unhappy/disinterested. Kate broke her wedding vow contract, to her husband, children, in the eyes of God. What's the title? "I Just Want You to Know: Letters to My Kids on Love, Faith, and Family"
Her book is a fraud. Kate's love has a terrible price to pay for everyone in her life. If anyone wants her love, they must strictly abide by her freaky controls, comfort her when she has a panic attack, worship her, but most importantly, pay her $$$$. I fear for J&K's children if Kate does not receive professional help. Her faith is a fraud. The churches who gave love offerings PAID for her faith. She stopped going to church because she was "too famous" and taking the Gosselin 8 was "too hard by herself." Where is faith for her children to continue their fellowship in church? No $$, no faith. Kate's book is a fraud. She made a choice to ostracize family members/friends who "didn't know how to help" or might take the shine away from her. 1. Kenton & Charlene Kreider, estranged because when the sextuplets were born, Kate did not want donations, only $$$$. 2. Kevin & Jodi Kreider were the only Kreider family members helping J&K. Remember when Kevin said, "...Kate used to always get me to do her chores when we were little..." They helped with baby sitting ALL THE TIME! 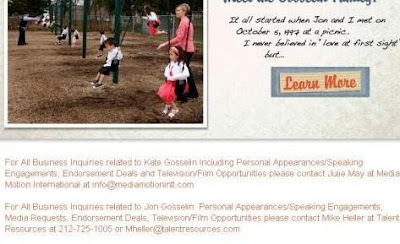 I don't recall K&J ever asking to be compensated because they loved the Gosselin 8. When TLC offered Jodi a contract and compensation. Kate went balistic! "No one makes $$ off of my kids..." Ha, ha, ha. ONLY Kruella Kate makes money off her little Gosselin 8!! 3. Beth Carson, the AUTHOR of the 1st book NOT Kate. What happened to that friendship? J&K "lived it," Beth "wrote it."